Dental implants are used in place of natural teeth. A single dental implant replaces the tooth and root with a titanium post. The implant itself will be the same size as your natural tooth. It's fused to the patient’s jaw bone for stability and strength, making it a worthwhile process. Fusing the titanium to the bone can take anywhere from six months to a year. After the fusing is complete, we’ll begin the next step of the implant process, which is securing a dental crown to the titanium post. We’ll provide you with a temporary implant that you can wear to give you a bright and beautiful smile until the permanent implant is ready. 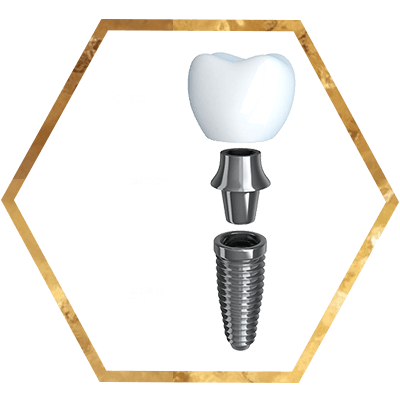 When your dental implant is complete, you’ll have a synthetic tooth root fused to your jaw bone and a dental crown to take the place of the tooth for aesthetics. Your dental implant will aesthetically be gorgeous and function like the tooth you once had in the past. Because implants don’t rely on any adjacent teeth, they are a very conservative and impressive way to replace a tooth. Dental implants are intended to be a long-lasting solution for tooth loss, and should be cared for with brushing and flossing - just like your natural teeth. They also eradicate the need to use dental adhesives. When it comes to missing teeth, the neighboring bone begins to contract or shrink and becomes increasingly fragile, jeopardizing adjacent teeth and raising the chance of a modified appearance. Non-implant supported dentures, such as partials or bridges, can hasten this process. However, dental implants can limit or halt bone deterioration, helping conserve your natural facial structure. Individuals with missing teeth or non-implant-supported options have difficulties enjoying certain foods, such as fresh fruits or vegetables, which can compromise their nutrition. Denture-wearing patients often lose their capacity to taste foods. Chewing can also be challenging and painful, jeopardizing digestion. Because dental implants function more like your real teeth, these extend the benefits of better health due to enhanced nutrition and taste, as well as proper digestion. Even top-of-the-line partials and dentures are inclined to slip and click if left unsupported. No longer will you be left wondering: Will I be embarrassed by my dentures—again? Can they notice the metal clasps on my partial? Take back control of business meetings, dining out, and social activities with dental implants. You will talk and eat with more comfort and smile even wider because you'll have the confidence your teeth won’t slip or fall out! ‘‘I met Dr. Montgomery and Tammy for the first time. Both were very thorough and informative and made me feel confident that my dental care is in good hands. Each patient is different, which means there’s no right or wrong answers. 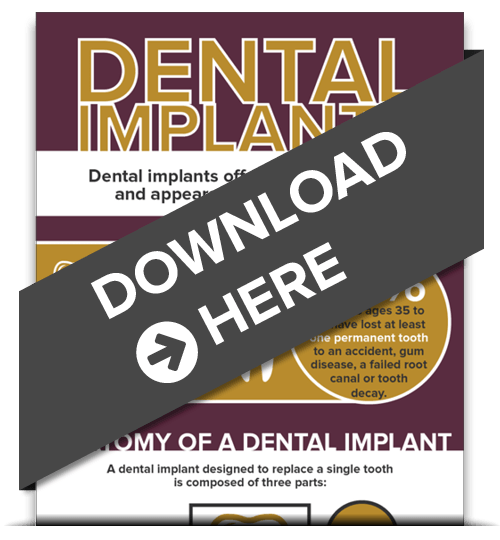 To learn if a dental implant would be the best solution to your dental concerns, download our FREE infographic today.